Working with beads can give you some beautiful effects and they are one of the most versatile products you can buy. We all want our cards to stand out from the rest and we look for different ways to achieve it without breaking the bank in the process. and there is an amazing choice in every colour you could need. The link opens in a new window so you can browse around. You will find all the items you need to make some stunning jewelery ... but here I have given you just a few examples of other ways to use these lovely embellishments in your cardmaking. ... and then add them to your creations for a really pretty look. 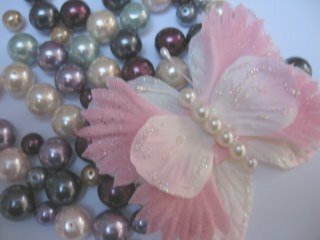 Using wire, beads and flowers create a corsage. 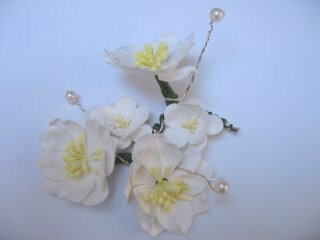 Thread the beads onto the wire and twist it, adding in the flower stems as you twist. 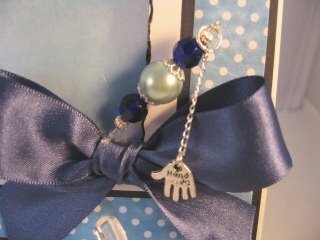 ... and keep them as the focal point to your card with just the addition of a sentiment. The pale blue of the papers goes really well with the creamy coloured flowers and the cream pearls. 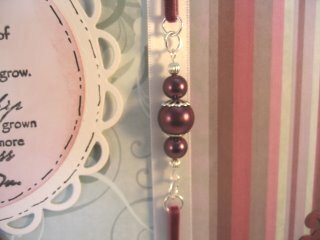 Another idea for working with beads is to use them to join the ribbon on your card. Here I have selected a medium size bead, and put bead caps on each end. 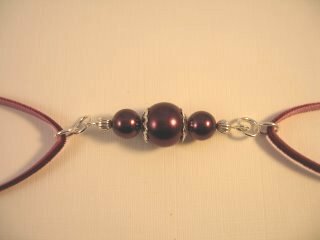 I have used a smaller one on each side, with a little silver bead to finish. Then on both ends I have used jump rings to be able to loop the ribbon through. I have used a thin velvet ribbon to hold the embellishment in place and fastened it to the back of the panel with strong glue. 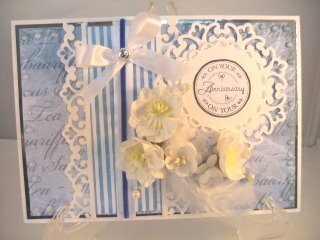 Use cream or white pearls for a wedding card to give a really expensive look. Use seed beads as the centre to your flower. I have layered up the flower petals and inked the edges of the centre, then with some Glossy Accents I have glued these tiny beads in place and allowed it to dry. I have also threaded more of the same bead onto some wire for the flowers stem. 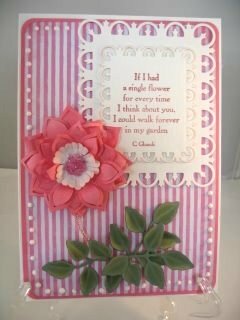 This card has then been created around the flower and the appropriate verse stamped onto some white card. 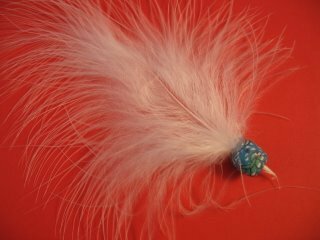 A very quick and simple way is to choose a really outstanding bead and thread a feather through the centre. This bead is square, patterned and has a crystal on the side which I have added it so it is facing outwards. 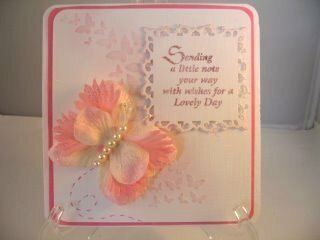 Just the ribbon and sentiment complete this very easy card. All these ideas and many more can alter the look of your cards, and working with beads can open up a whole new world for you. 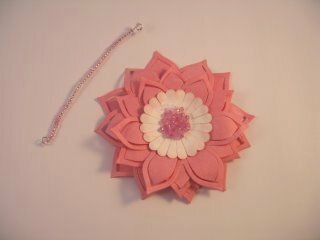 You could create a lovely piece of jewelery and add it as a gift for someone extra special. 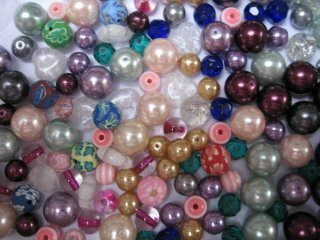 Take a look at Bead Crafty for some beautiful beads.